Wild harvested and hand picked at elevations of 1200 – 1500 meters gives Organika's oregano oil a higher Cavacrol content level in the oregano leaves used. The soil in these areas is untouched and mineral rich therefore no herbicide or pesticide is used. Organika's oregano oil extract comes from the mediterranean and contains 80% active ingredient (carvacrol) in a base of pure olive oil. Oregano to has been proven to have a potent anti-fungal, anti-parasitic, and anti-bacterial effect. Doctor recommend for patients with Candida, parasites, colds, flu, bronchitis and other infections. 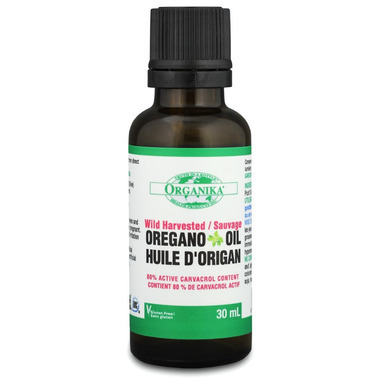 Organika Oregano oil can be taken orally for optimum absorption for this clinical strength, fast acting alternative to echinacea or golden seal. Directions: Add 1-3 drops to hot water or a vaporizer 3x daily or as required. Ingredients: Olea Europaea (Olive) Fruit Oil, Origanum minutiflorum, Tocopherol. Avoid contact with eyes and mucous membranes and when pregnant. Discontinue use immediately if irritation or hypersensitivity occur. Use a few drops in water for colds. swear by this method and a good value for the price.